As you likely know, DPW provides click-level traffic statistics by artwork in your my Traffic tab in your my Paintworks page. You can also view your your traffic in real time, as it happens! I am not going to go into detail about how to set up and configure an Analytics account because Google gives you all the detailed step-by-step you need here. I will however, outline the steps and provide the necessary DPW specific information below. If you already have an account - great - all you need to do is set up a new profile for tracking your DPW traffic. Each website or blog you track must have its own profile within your Google Analytics account. Once you have entered the profile information, click the Get Tracking Id button at the bottom of the profile form to be given the tracking id you need. The id will look something like this: UA-XXXXXXXX-X where the X’s are digits. 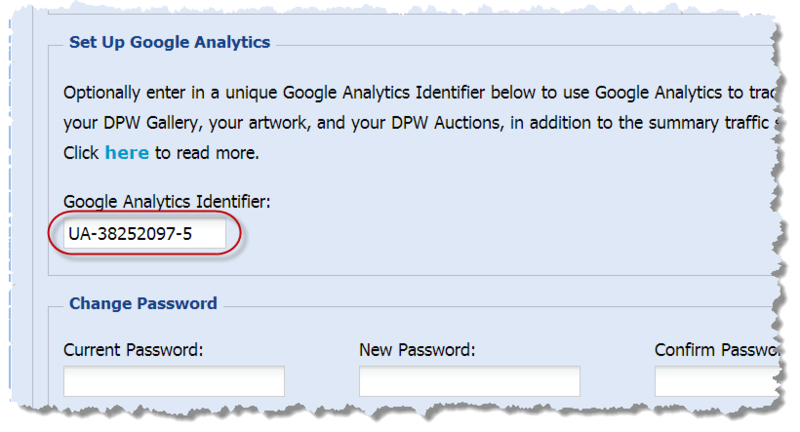 Copy and paste the id into the Google Analytics Identifier field in your DPW Account Information page (you will need to scroll the Account Information form down to see the field). Important: Google will also give you code to paste into your web pages. You do not need this code, as DPW will automatically put it into your DPW pages for you. Important: After you enter and save your tracking id in DPW, you may see back in your Google Analytics account where it says "Status: Tracking not Installed." Please ignore this - despite how it sounds, it is not important and will not effect your tracking. Important: Your traffic will not be available to view for up to 24 hours. 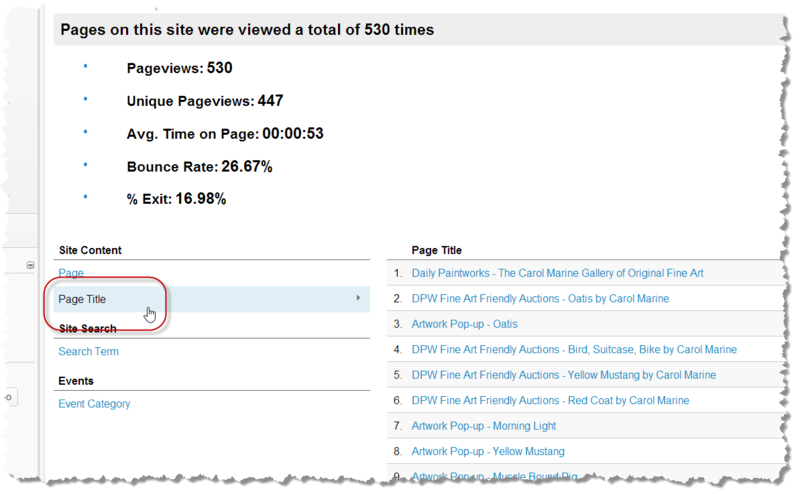 Once it is available, the important thing to know is that Analytics can show your traffic by page URL or by page title. You will want to view it by page title since the URLs alone are fairly cryptic and often don’t tell you at all which artwork the page is for. So, be sure to chose to view your traffic by page title, where possible. Be sure to check out the real time view of your traffic in Analytics - it is very cool to see! Posted - Thu, Feb 7, 2013 at 7:54 AM. This article has been viewed 9331 times.